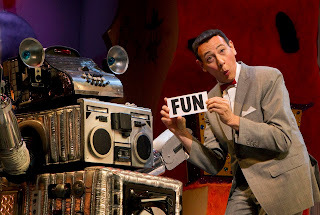 I must confess that, until recently on YouTube, I hadn’t watched a minute of Pee-Wee (aka Paul Reubens) Herman ‘s 1980’s CBS show, “Pee-wee’s Playhouse,” so I can only take his new show at face value. Surrounded by screaming fans who relished every silly moment, I found the show to be, if not quite theater in the traditional sense, certainly a canny resurrection of the series and its well-preserved star. 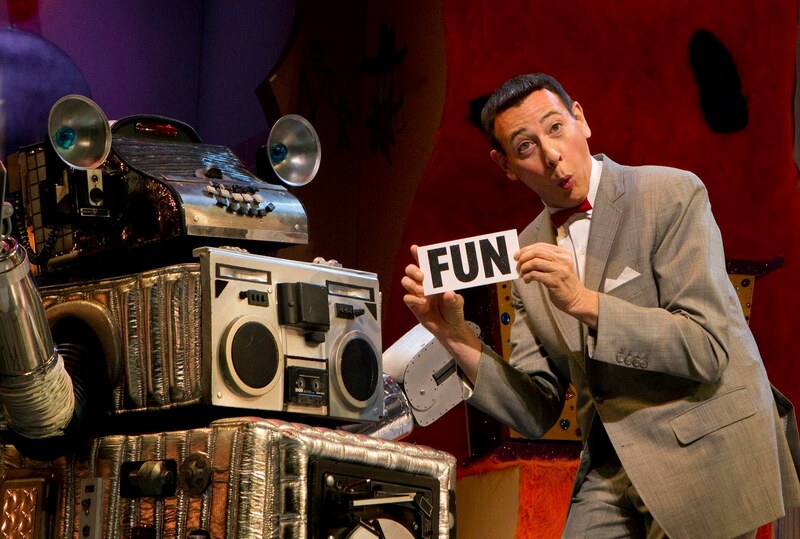 There was not a child to be seen in the audience, but the now-adult fans that made up the very full house were totally in the moment, laughing with Pee-Wee, never at him. Reubens – looking very much the same as his 80’s self – still projects that sweet, impishly naughty persona. All the beloved characters from the show are here – Chairy, Sergio, Cowboy Curtis, Globey, etc. -- and three of them are recreated by the original players, including Lynne Marie Stewart as Miss Yvonne, John Moody as Mailman Mike, and John Paragon as Jambi. Some of the material (book by Reubens and Bill Steinkellner, with additional material by Pargaon) is mildly racy, with some very subtle allusions to Ruben’s unfortunate run-in with the law, but nothing to offend should an actual youngster be in the house. David Korins’ child-friendly set and Ann Closs-Farley’s amusing costumes – based on the original designs -- are right on the money. Basil Twist’s clever puppetry is another plus. Outsider to all this that I am, I can’t say I was heartbroken when the 90 intermission-less minutes came to an end. But after seeing it, I was, at least, able to understand something of the appeal of both the show and Reubens himself, and it was rather lovely to see the crowd embrace him so warmly throughout the evening.